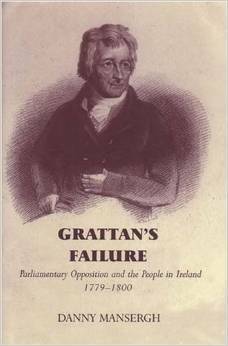 Henry Grattan was the Irish MP credited as the founder of the independent Irish constitution of 1782-1800. This book centres upon aspects of his ideology and political practice. Categories: 18th Century History, Political History. Throws new light on the underlying causes of the 1798 rebellion and 1800 Act of Union, by examining the connection between parliamentary and extra-parliamentary agitation between 1779 and 1800. Despite the title the book is not biographical but centres upon aspects of the ideology and political practice of Henry Grattan. This is because it is contended that Grattan was the Irish MP most deeply and frequently involved in manipulating popular movements in this period – contrary to the prevailing historiographical and biographical portraits of him as a strictly constitutional statesman. His vision of the Irish constitution included both broad popular participation and (through it) effective as well as theoretical legislative independence: hence his pivotal position within the study. It is argued that the existing histories have understated the importance of his role, along with that of his parliamentary collaborators, in sowing the ideological seeds of an attempted revolution and in personally encouraging extra-parliamentary agitation. He is popularly credited as the founder of the independent Irish constitution of 1782-1800 – but he also played a part in its destruction. Danny Mansergh is from Dublin and studied History at St. John’s College in the University of Cambridge between 1995 and 2002, where he was awarded his PhD. He has written several papers and articles on the subjects of the Act of Union and late eighteenth-century Irish political history. He is currently living in London.